Photo sent in by Russell Nell. 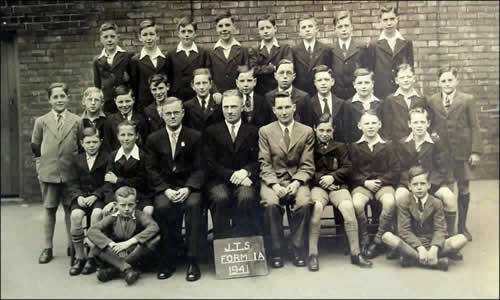 Here is my old Form 1a of Sunderland Junior Technical School, taken in 1941. Back Row: Ron? Wright, Ernie Finn, Bill Snowball, Ron? Hall, Tom Rowley, Ron Hope, Eric Snowdon, Allan Burdis. Second Row: Mat Pearson, Ron Wells, Les Allen, Ray Dudley, Ron Pearson, Ron? Burdon, Ken Carlisle, Charlie Hill, ??? Scott, Bill Hearn, ??? Davis. Third Row: (seated) Dan Veitch, Arny Forster, Mr Davies Form teacher, Mr Canney Headmaster, Unkown Teacher, Roy Elms, Ron Turnbull, Bill Hekles. Front Row: Myself (cross legged) on the left & Don Howe on the far Right. Russel also mentioned that he'd been evacuated twice during the war. First from Cowan Terrace School via Millfield station and Bishp Auckland to Leasingthorne, a mining village that I think is no longer there. Second evacuation was from Cowan Terrace to Middleham, North Yorks via Leyburn. Returned from Middleham to West Park Central for a very short stay, then to J.T.S.